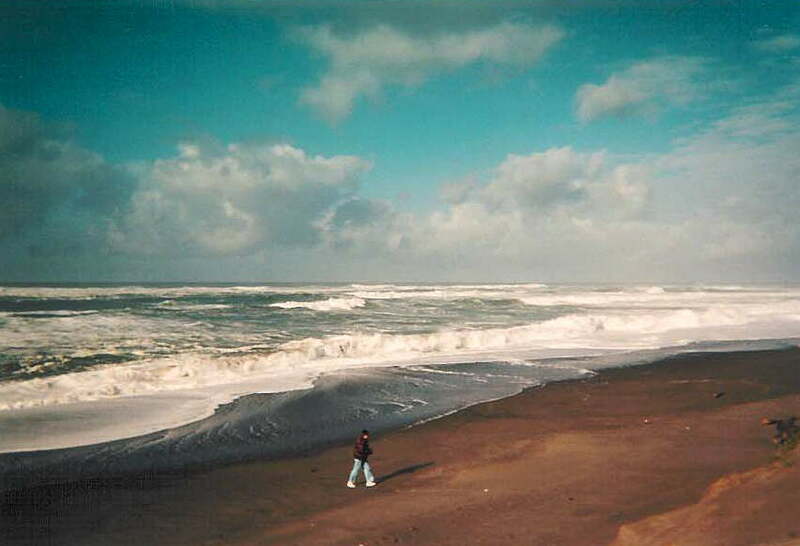 Bandon, Oregon on the coast is where I took my first Pacific Ocean beach walk in 2002. Yep! That’s me walking on the beach. The beaches along the Oregon Coast are often stretches that go further than the eye can see. You can walk for miles. This was a December day near the Bandon Lighthouse. 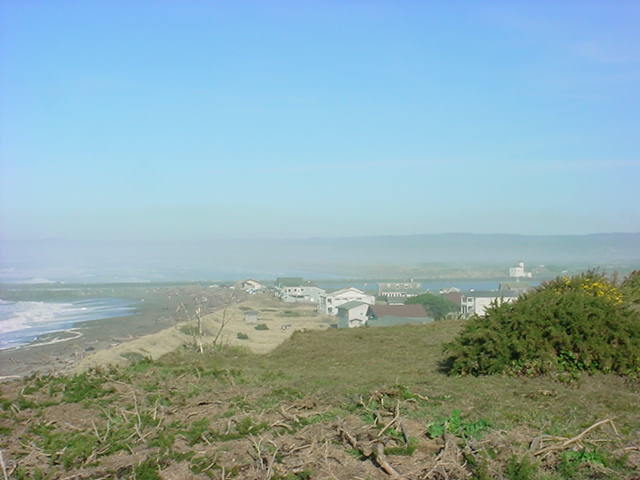 One of Bandon’s claims to fame is the mist that hangs in much of the time. 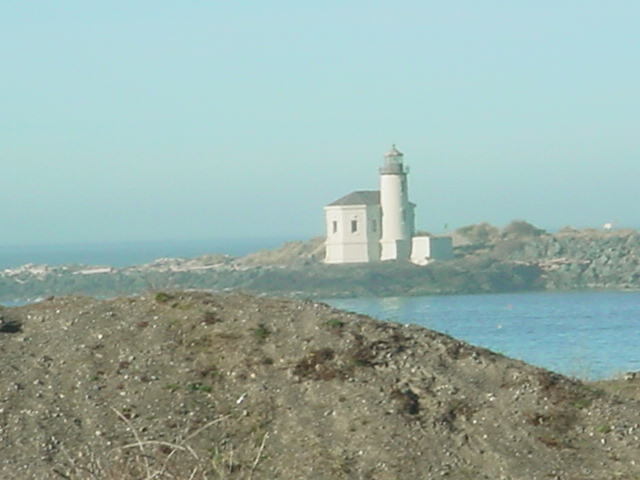 This photo of the lighthouse was taken on one of those misty, summer days. We will visit this lighthouse in depth another time. Bandon, on the South Oregon Coast, is known as “Bandon-By-The-Sea.” It is a small town with a lot to offer and is considered a major coast resort area. 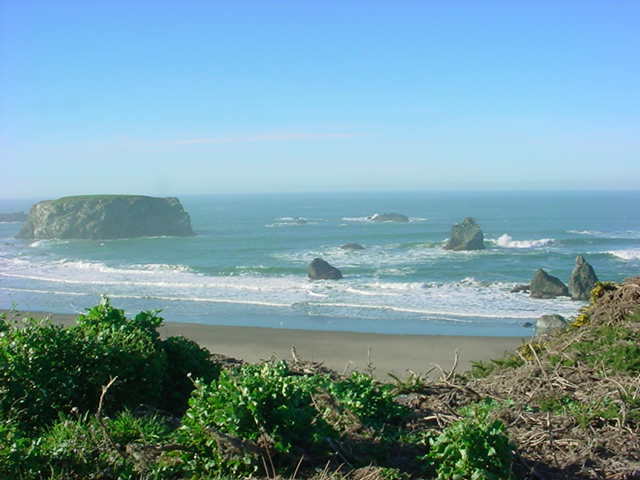 Bandon has a Western history in that the Coquille Native Americans were the first residents here prior to 1850. In 1851 French Canadian trappers discovered gold. 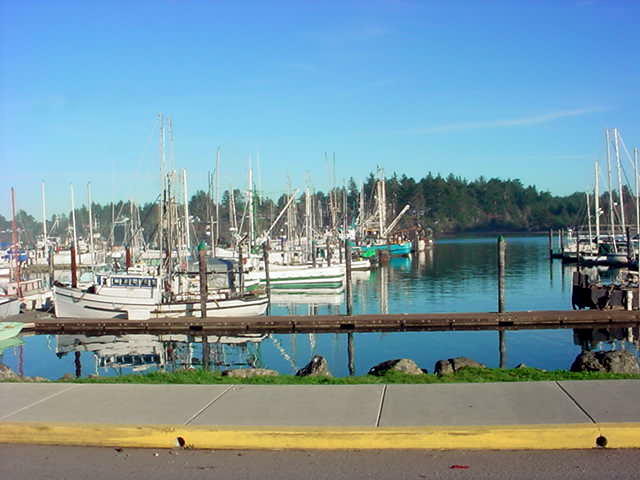 The first settlers arrived in 1853 and in 1856 conflicts with the Coquille started until they were moved to the Siletz Reservation. In 1873, George Bennett and his sons arrived from Ireland and re-named Averille, Bandon after Bandon, Ireland. Thus Bandon was established and grew as a town and not just a settlement. Along with agriculture and tourism, other industry in this very small town (2010 pop was a bit over 3,000) is fishing and wood products. Both timber and fishing diminished greatly by the 1980’s though some of both still remain. 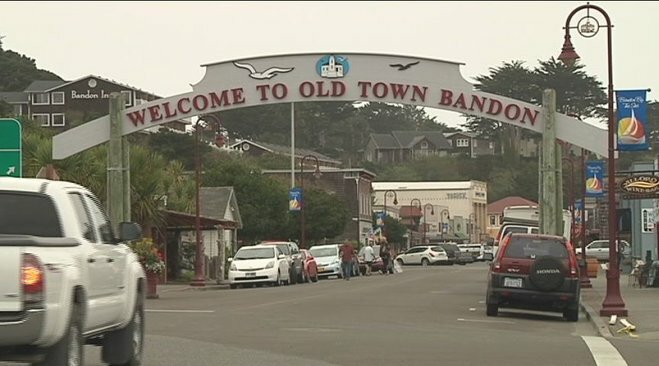 The center of Bandon is old town. Here you will find many shops and restaurants. 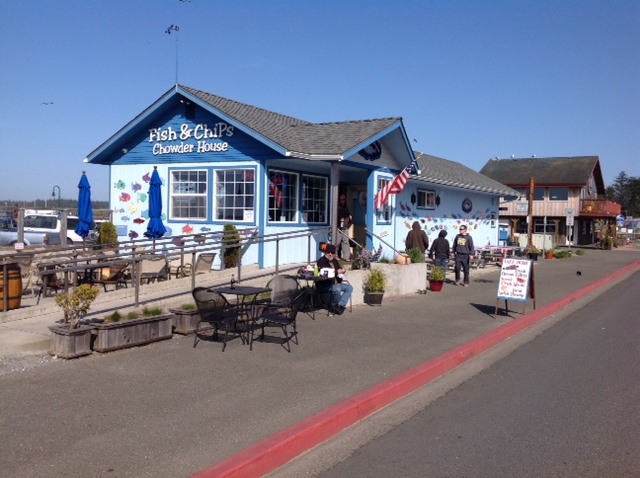 Bandon is definitely a tourist haven with lots to see and do and easy to get around. Plan to spend at least a couple of hours here. The Wharf is on the right in the above photo as you drive along. There’s a lot to see here and you’ll want to hang at the wharf taking it all in. There is plenty of parking and our favorite place to eat is here, too. And of course the boats! Bandon is a golfing destination with Bandon Dunes Golf Resort, Bandon Golf Supply and Bandon Crossings Golf Course. There are many places to stay but we like the small motels along the scenic drive that are up on the cliffs overlooking the ocean. No trip to Bandon would be complete without taking the 5 mile Ocean Scenic Loop Drive along the cliffs past houses, motels and one of the golf courses. The picture below was taken from the north end of the scenic drive. Again note the mist that hangs here. The lighthouse is in the distance on the right. I’ve taken random shots of the rocks at Bandon and you can see one below. Come stay with us at Umpqua River Haven and visit Bandon which is less than an hour’s drive from URH and take some of your own photos of the rocks that reside in the misty waters of Bandon! And for our friend, Mike W. , you were correct that the photo in a previous blog isn’t Face Rock! My bad, Mike! Hope you’re still reading us! Visited Bandon many years ago and it still must be a wonderful place!